If your picture stinks, get closer. The more you practice, the “luckier” you get. And remember, it’s a poor workman who blames his tools. For this awfully delicious holiday dessert you’ll need to borrow a sticky bottle of Crème de Menthe from your grandmother’s liquor cabinet. 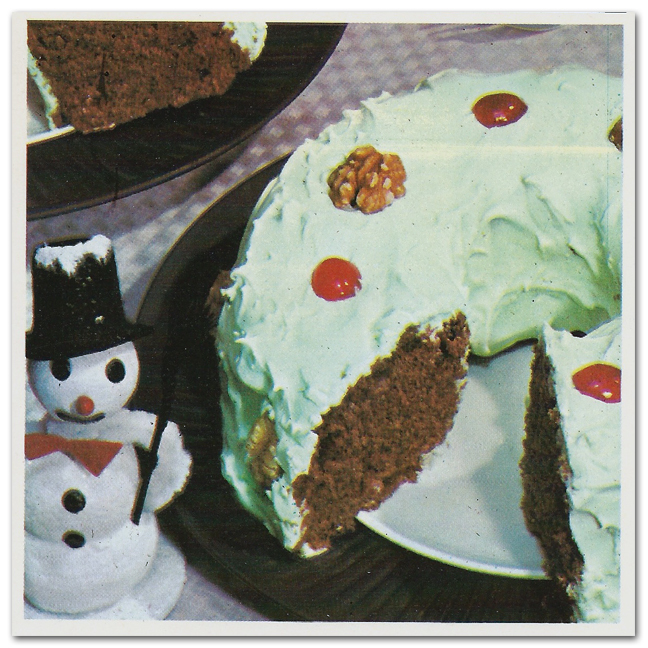 This cake will keep for weeks and becomes less awful as you eat more and more of the Crème de Menthe icing. 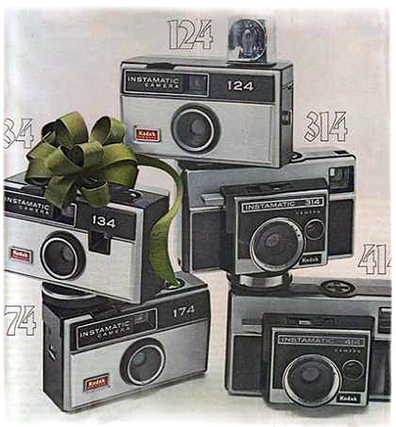 Have an awfully happy holiday time! Bon appétit! Or, non appétit? A big ol’ ring o’ cottage cheese! 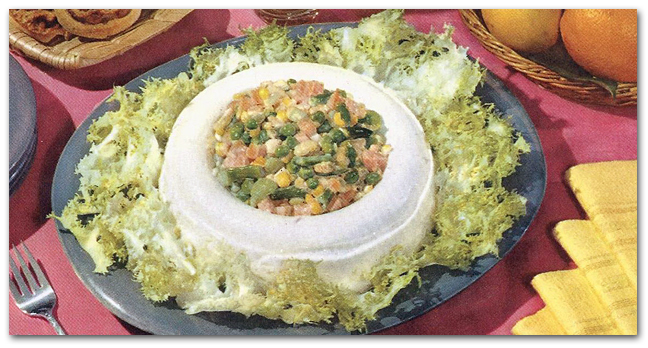 Won’t your guests be surprised when they see your creation of chilled and molded cottage cheese with a vegetable medley? Of course they will be – awfully surprised! 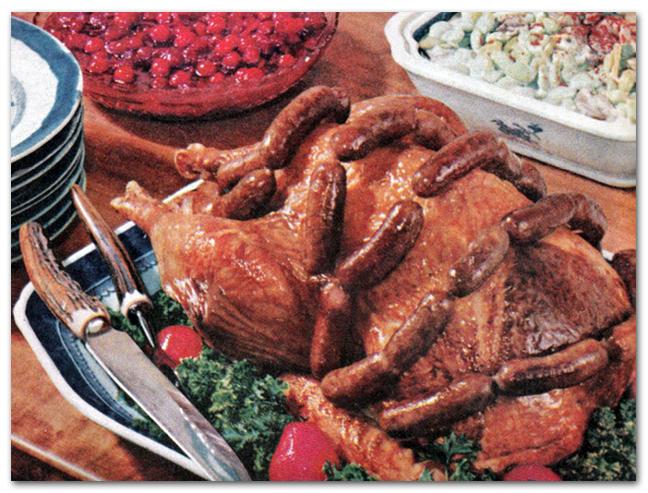 When your host brings out the turkey and it’s festooned with little sausage links, you’ll be glad you brought along an equally awful side dish to complement the Thanksgiving meal. Sprinkle gelatin over 1/2 cup cold water in saucepan. Stir in some dehydrated onion flakes. Stir over low heat until gelatin dissolves. Stir in remaining water, vinegar, sweetener, and salt. Chill until syrupy. Fold in beans, pimento, and mushrooms. Turn into a 5 -cup mold. Chill until firm. Unmold. Garnish with watercress. Awfully good stuff! 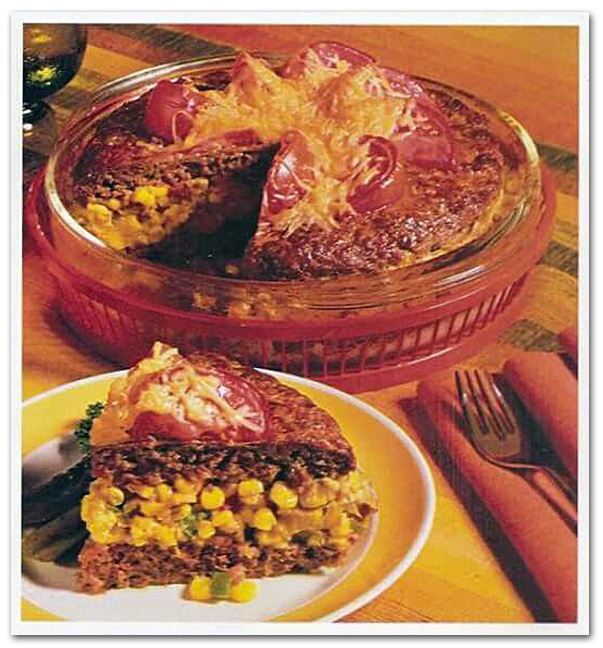 This is a giant hamburger that’s been turned into a casserole. A colorful vegetable layer is sandwiched between two large meat patties. Cut in wedges to serve. If you like, skip the tomatoes on top and serve this giant burger with warmed catsup. 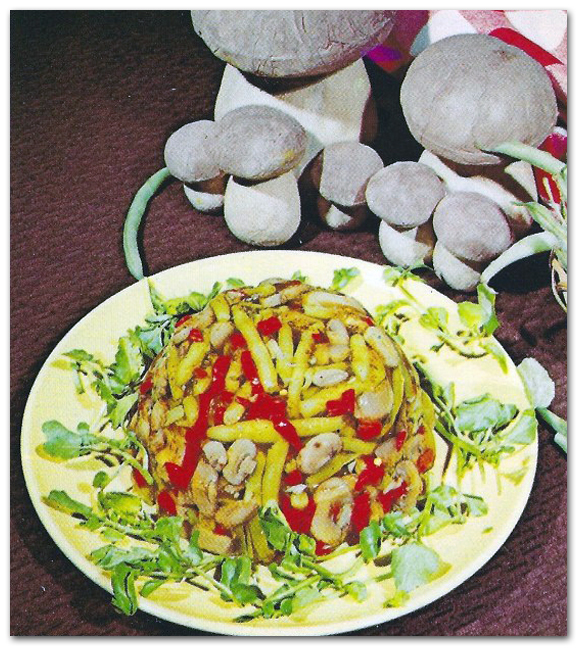 This is a Russian inspired dish of sautéed hamburger meat served in some sort of sauce. 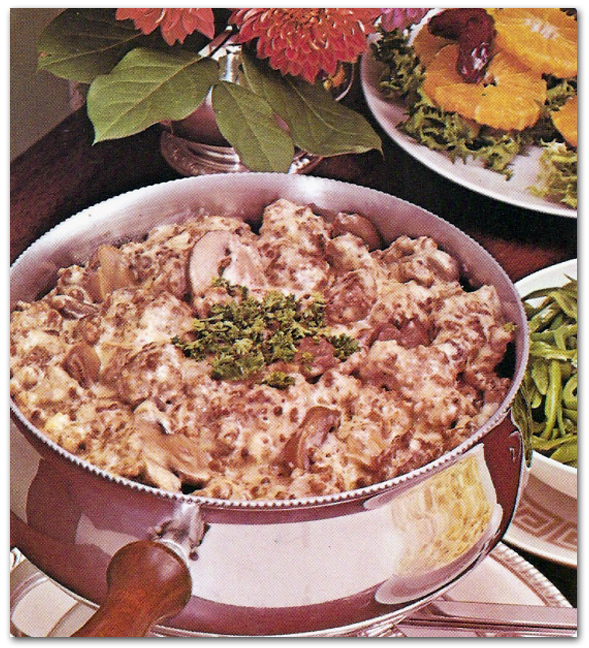 Brighten this awfully popular casserole with a parsley or chive garnish or a generous shake of paprika. Add a green salad and rolls and you have a savory dinner for four. Awfully delicious! Here’s the awful details. Combine tuna with mustard and Worcestershire. Mix spinach with parsley flakes. 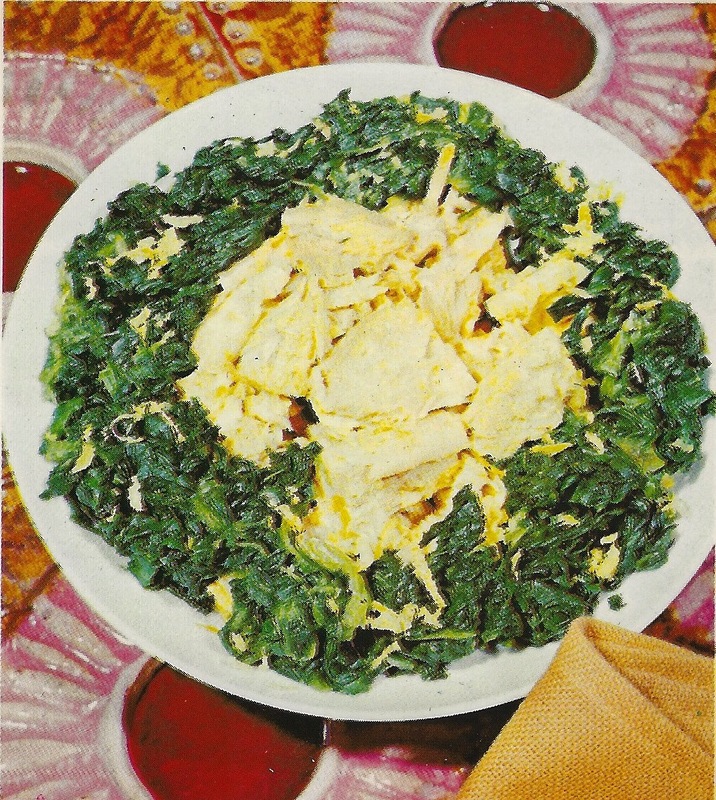 Combine milk, butter flavoring, garlic powder, and mace; add to spinach. Spoon tuna fish in an even layer in a non-stick shallow baking dish. Top with spinach mixture. Heat in a medium oven. Awfully good!